Thus far, we’ve completed the first 11 letters of the alphabet. (Check out our previous “Who Dats”: Unknowns beginning with the Letter A, Letter B, two pages for Letter C (here and here), Letter D, Letter E, Letter F, Letter G, Letter H, Letter I, Letter J and Letter K.) We even have one of buttons with pictures only — no names. That’s even harder to decipher. We now bring you to the Letter L. The little we know (or think we know) about these buttons will appear in the descriptions below. Can anyone help with the identification of these buttons? ROW 1 — Jim Largent for Congress (button 3) is Virginia 1962. The Lefkowitz/Newman/Schlesinger (button 4) is thought to be from NY, but that’s it. 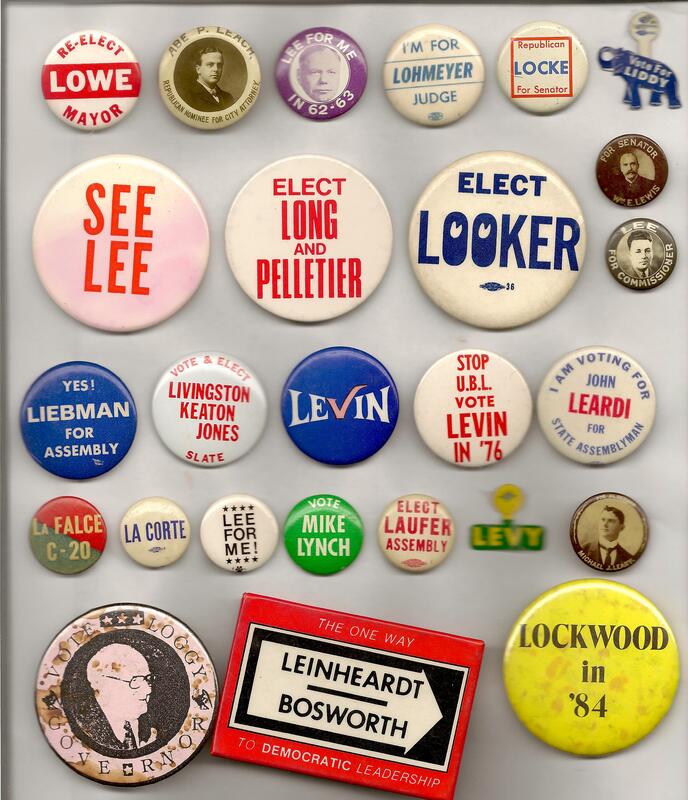 Joseph Lloyd for commissioner (button 6) has Oakland backpaper. ROW 3 — Leo Legros (button 2) is from Mass. 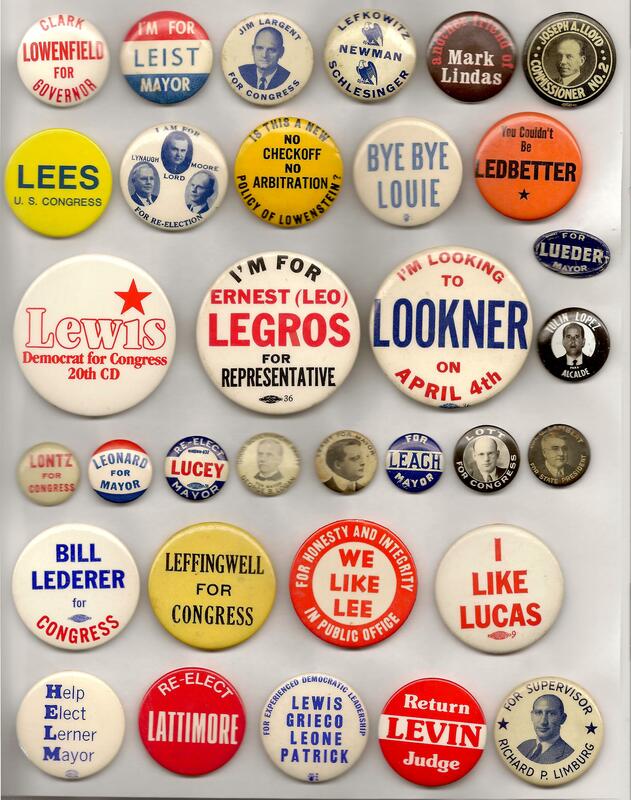 Lueder for mayor (button 4) is Chicago 1923. ROW 4 — George Logan for mayor on the Good Government Party ticket (button 4) is Allegheny, Pa. in 1906. Wm. Lambert for state president (button 8) may not be political; it could be for the state president of the Elks in Ohio. ROW 6 — Richard Limburg (button 5) could be from Westchester County, N.Y.
ROW 7 — Abe Leach for city attorney (button 2) is from Oakland, Calif. in 1905. ROW 8 — Wm. E. Lewis for senator (button 4) could be upstate New York in 1902. ROW 9 — Leardi for Assembly (button 5) is a Democrat from Westchester County, N.Y., in 1966. ROW 10 — Michael Leary for Alderman (button 7) is from Boston. Lees — probably Brian P. Lees, the sacrificial GOP nominee against Edward Boland in Massachusetts 2 in 1986. Went on to become a state senator. “Republican Locke for Senator” — Possibly David H. Locke? He was a Massachusetts State Senator, 1969-93. Clark Lowenfield — This one’s a little off-the-wall. A high-school student named Clark Lowenfield was apparently elected “youth Governor” of something called the “Youth and Government Conference” in Texas in February 1975. Sounds a little like Boys State/Girls State, but sponsored by the YMCA. It’s hard to believe that anyone would actually have buttons printed for something like this, though. Lefkowitz-Newman-Schlesinger is probably from 1961 when NYS AG Louis Lefkowitz was GOP candidate for Mayor. Bernard Newman was NY County GOP Leader & may have been a candidate for City Council or Judge. I don’t about Schlesinger. I hate to rain on your parade here, but I’m skeptical that the “Jim Largent” pin is from the 1962 Virginia 7th C.D. race, since the Largent who ran in (and lost) the Democrat primary to Judge Jack Marsh was Flournoy Leonard Largent, Jr. So unless Flournoy Leonard Largent, Jr. went by “Jim” — possible, but seems unlikely — I think that’s not the answer. Daniel Fox to the rescue! Wm. E. Lewis, a Republican from Utica, NY lost the State Senate race for the 34th district in 1902. George B. Logan was the unsuccessful Good Government candidate for mayor of Allegany, Pennsylvania in 1906.